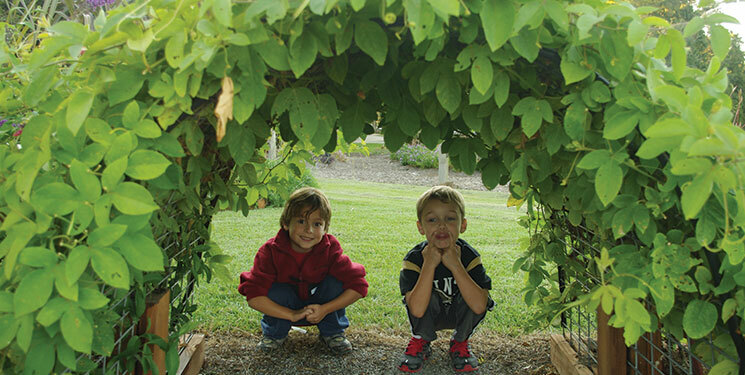 Young boys play in one of the LSU AgCenter’s educational gardens. Hands-on learning is an important complement to classroom lessons about environmental issues. Several local corporations have dedicated gifts to this purpose through school programs at the LSU AgCenter Botanic Gardens at Burden. The Dow Chemical Company recently awarded the AgCenter a $10,000 grant from the DowGives Louisiana Community Grant Program, designed to support projects tied to STEM (science, technology, engineering and math) curricula, economic development or sustainability. The grant will enable construction of an outdoor classroom space in the children’s garden that will serve as a teaching shelter. The shelter will offer classroom capacity and shade to visitors of the children’s garden, an area built to show teachers and parents how to teach math and science skills to children through gardening. Wooden tables and benches will be built for activities and small group exercises. A storage area will provide space for gardening tools, watering cans and other educational supplies. The Botanic Gardens’ Trees & Trails program will soon cut the ribbon on an educational pavilion, funded in part by a $20,000 donation from The Weyerhaeuser Giving Fund. The gift is part of Weyerhaeuser’s ongoing mission to support education and community outreach as good stewards of nature and business. The pavilion will provide a space for up to 120 students at a time to participate in Project Learning Tree, a nationally acclaimed program that emphasizes strengthening problem solving, critical thinking, and team building skills. More than 1,400 children from 17 schools participated in the program in 2012-13. The space will feature ceiling fans, old New Orleans brick columns and an open-hearth brick fireplace for cooking demonstrations and expanded lessons in nutrition. Contributions from Albemarle Foundation will fund five new school gardens. Through gardening, children can learn about science, mathematics, English, environmental studies, family and consumer sciences, health and art. Gardens help students understand where fresh food is grown and provide them firsthand learning experiences about the importance of plants, nature and the outdoors. This summer, LSU AgCenter school/community garden specialist Dr. Kiki Fontenot will lead workshops about class gardens for teachers. She will demonstrate how to build and sustain a garden, and how to integrate that garden into their curricula. The training will include demonstrations in the model children’s garden at the Botanic Gardens.